Great time had by all, including so many new faces. Each client was extremely happy with the quality of the chair massage and got up feeling slightly taller than when they sat down. Thanks to Guy, Derek and Simon for hosting the event and looking forward to the next party. Business Biscotti Reading East‘s Summer Party. 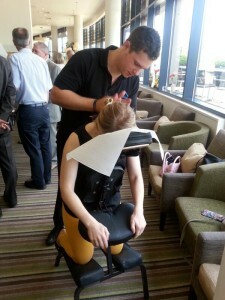 I volunteered my time to offer relaxing chair massages to fellow businessmen and women whilst they networked and chatted at the Holiday Inn, located at Thames Valley Business Park. Guy Griffiths of GG Fit, Derek Spicer of Pico Productions and Simon Cook of Getvanillagreeted me and we set up the area. Also on offer to businesspeople was a professional portrait sample from Asya Barskaya from ABL Photography, for which I was the test shot so she could calibrate the camera. I was very impressed with how quickly she got a fantastic shot of me, after just 2 shots! She was snapping her way through the group of 40 people in no time at all and it was a great service to be offering. Just had my first appointment with Matt from Visiting Osteopaths and I am delighted with the results. The session took place in the comfort of my own home at a time that was convenient (less than 24 hours after I called). If like me you suffer from pain and lack of movement, then give them a call. I have had a problem with my lower back and hip for some time. Matt has been treating me on a monthly basis for the last three years. It is extremely convenient that I can have this treatment at home at a time that suits me. Matt is reliable and I find the treatment very beneficial. I highly recommend him. Why did I become an osteopath? Welcome to Visiting Osteopaths, providing pain relief for neck, back and shoulder issues in Wokingham, Reading and Berkshire.